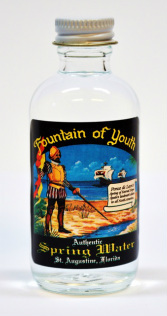 Water From the actual Fountain of Youth located in historic St. Augustine, Florida. Bubbling up from the Floridan aquifer for millennia, this spring water supported the Timucua people of Seloy – a Native American village that thrived on these grounds for over three thousand years. This unique water quenched Ponce de Leon’s thirst in his quest for eternal life, and this water was instrumental in the 1565 decision by Pedro Menéndez to establish the First Colony of St. Augustine here on the Park grounds. 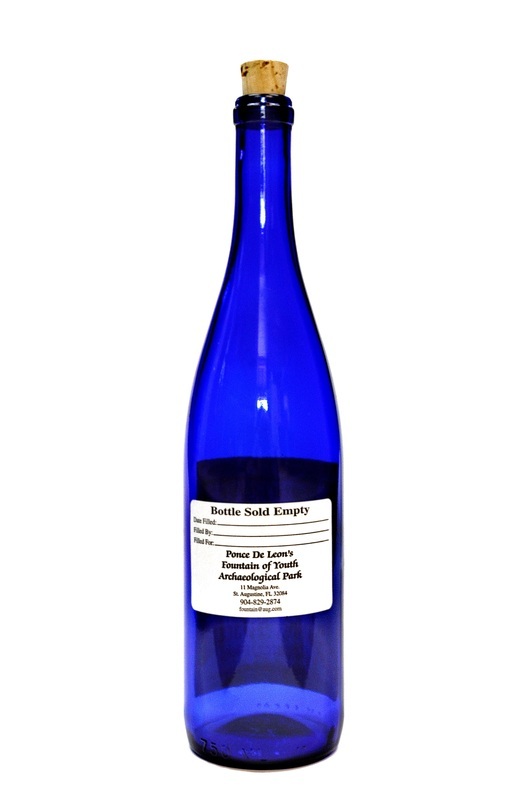 Please note: We sell the bottle empty as a keepsake from the Park. 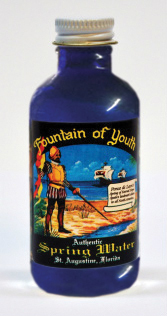 ​We then fill it with Fountain of Youth Spring water for FREE! 2 fl oz Twist Top Empty Bottle with Glossy Black Ponce de Leon Label. Freshly filled for FREE with water from the historic Spring at the Fountain of Youth. Sorry, U.S. shipments only. Bottle sold empty. We fill it for you for FREE! 2 fl oz Cobalt Blue Twist Top Empty Bottle with Glossy Black Ponce de Leon Label. Freshly filled for FREE with water from the historic Spring at the Fountain of Youth. Cap color may vary. Sorry, U.S. shipments only. Bottle sold empty. We fill it for you for FREE! 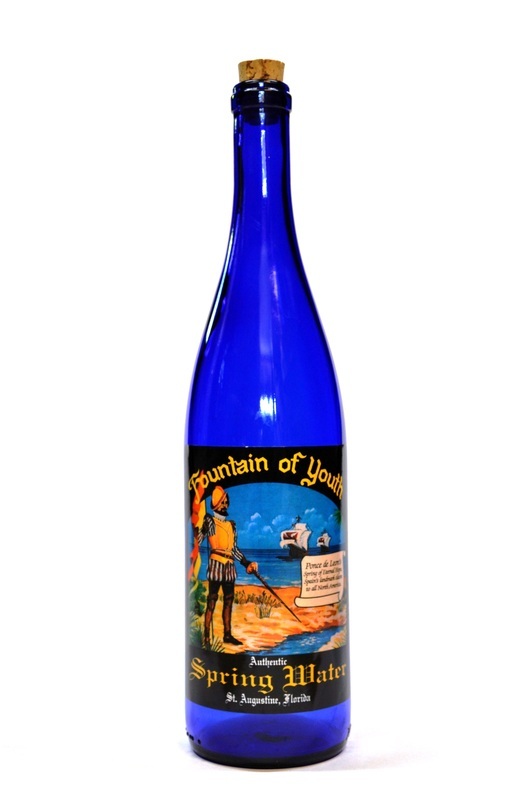 750 ml Blue Cobalt Empty Bottle with Glossy Ponce de Leon Label. 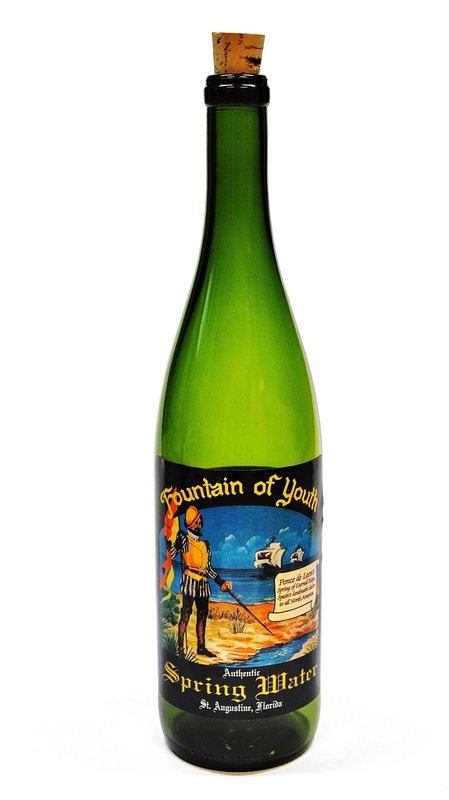 Freshly filled for FREE with water from the historic Spring at the Fountain of Youth and corked on the day of shipment. ﻿Sorry, U.S. shipments only. ﻿ We are currently unable to ship the 750 ml bottles to California and Hawaii. Due to weight restrictions, There is a maximum of 12 TOTAL large bottles per order, please. You may place multiple orders, but you may not exceed 12 large bottles in a single order. Bottle sold empty. We fill it for you for FREE! 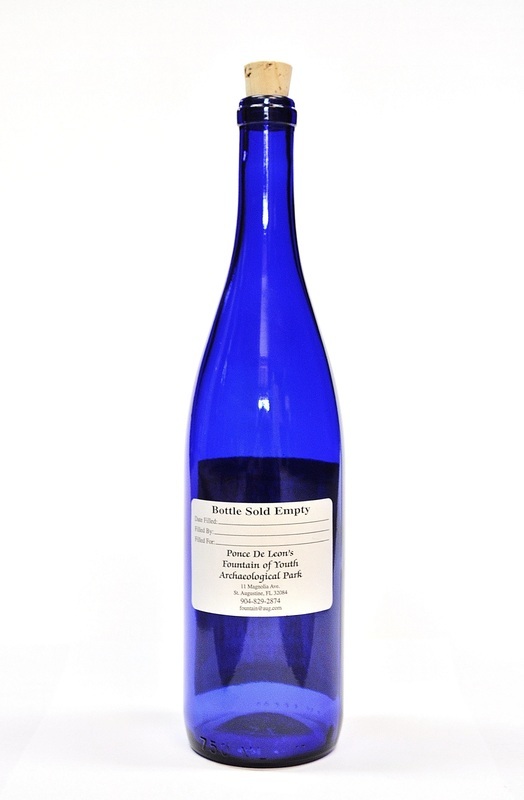 750 ml Blue Cobalt Empty Bottle with Parchment Label. Freshly filled for FREE with water from the historic Spring at the Fountain of Youth and corked on the day of shipment. Sorry, U.S. shipments only. We are currently unable to ship the 750 ml bottles to California and Hawaii. 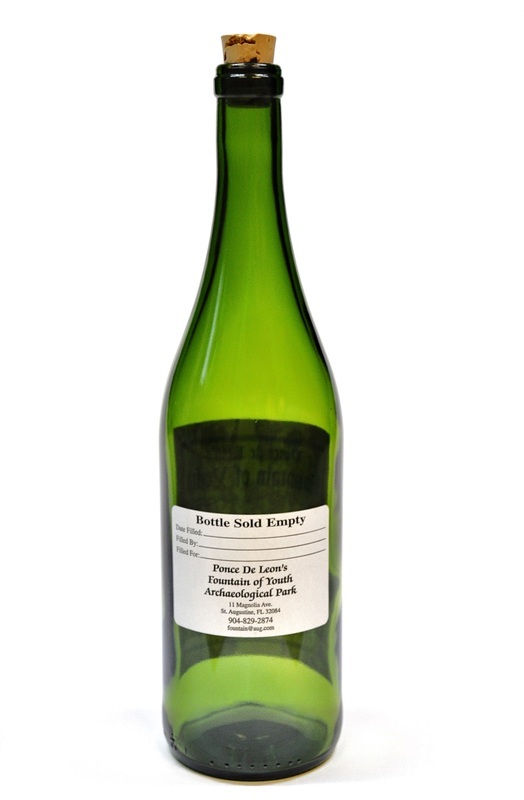 Due to weight restrictions, There is a maximum of 12 TOTAL large bottles per order, please. You may place multiple orders, but you may not exceed 12 large bottles in a single order. Bottle sold empty. We fill it for you for FREE! 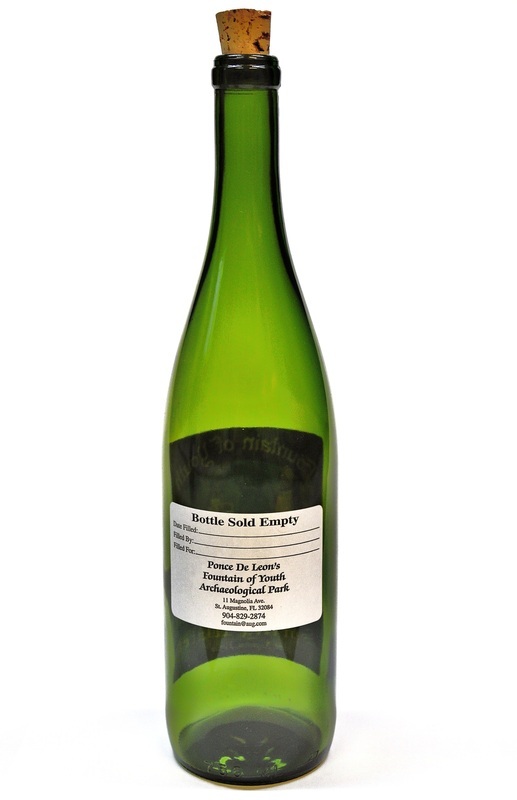 750 ml Champagne Green Empty Bottle with Parchment Label. 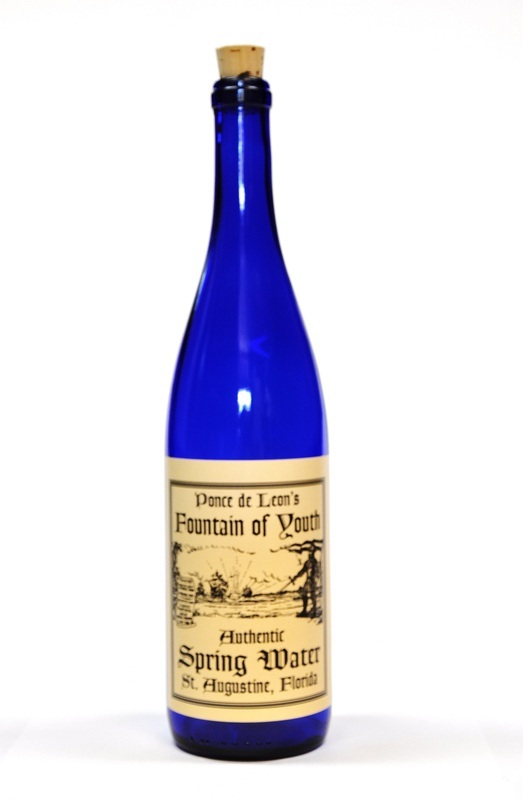 Freshly filled for FREE with water from the historic Spring at the Fountain of Youth and corked on the day of shipment. Sorry, U.S. shipments only. We are currently unable to ship the 750 ml bottles to California and Hawaii. Due to weight restrictions, There is a maximum of 12 TOTAL large bottles per order, please. You may place multiple orders, but you may not exceed 12 large bottles in a single order. Bottle sold empty. We fill it for you for FREE! 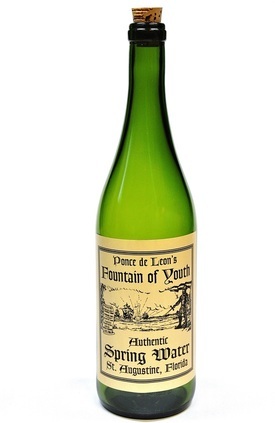 750 ml Champagne Green Empty Bottle with Glossy Ponce de Leon Label. Freshly filled for FREE with water from the historic Spring at the Fountain of Youth and corked on the day of shipment. Sorry, U.S. shipments only. We are currently unable to ship the 750 ml bottles to California and Hawaii. Due to weight restrictions, There is a maximum of 12 TOTAL large bottles per order, please. You may place multiple orders, but you may not exceed 12 large bottles in a single order. Bottle sold empty. We fill it for you for FREE!